KeyBank Live at Larkin is almost here and we can’t wait for this year’s lineup! With a fresh mix of local acts and national bands, you won’t want to miss a minute of this free concert series. First up – Big Mean Sound Machine. Catch BMSM performing with Miller and the Other Sinners on June 6 at 5pm at Larkin Square. KeyBank Live at Larkin runs every Wednesday from June 6 – September 5 and are family friendly. 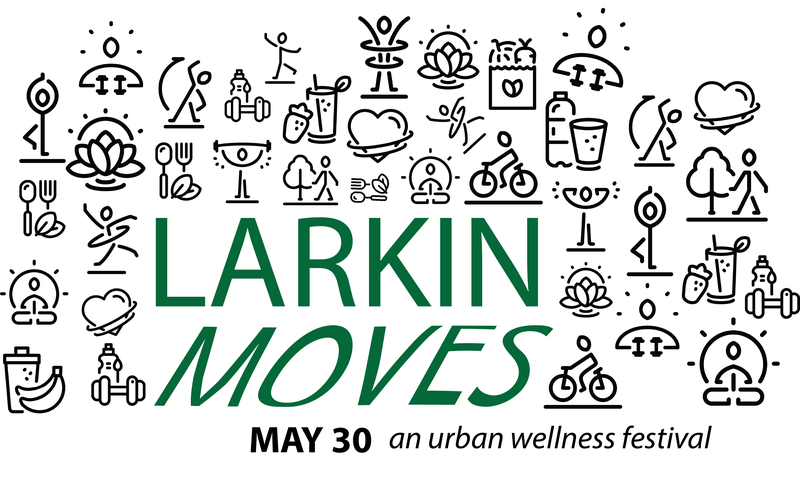 Free admission and parking thanks to Larkin Square’s presenting sponsor KeyBank and sponsor Independent Health. Check out the full line up below! 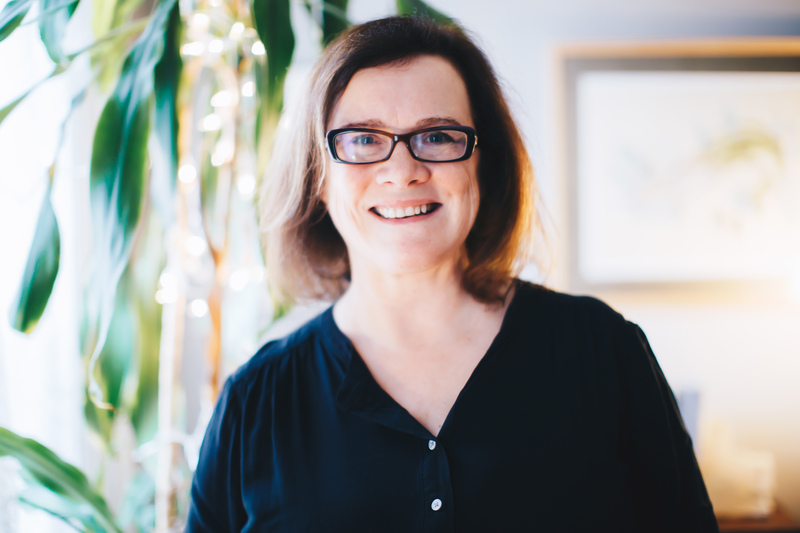 The Larkin Square Author Series welcomes you to a Celebration of Writing: Buffalo and Beyond on Thursday, May 10th at 5:30 pm in the Larkin Square Filling Station. 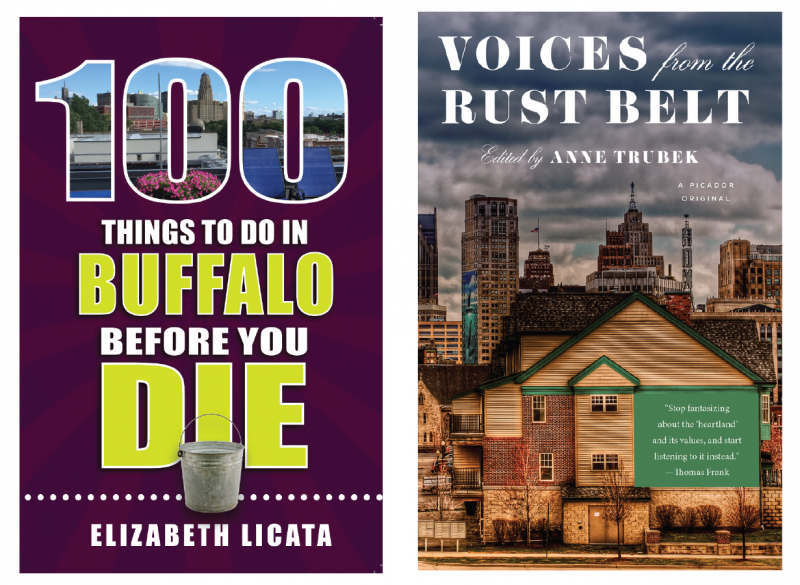 The event features Elizabeth Licata, author of the new book 100 Things to do in Buffalo before you Die along with the writers Jeff Klein and Ben Gwin who wrote essays for the new book Voices from the Rust Belt. Licata offers suggestions for Buffalo residents and visitors for enjoying “a rich banquet of intriguing history, iconic architecture, lush scenery, fun food, and a relentless nightlife”, (book cover). Suggestion number 57 encourages partying in the Hydraulics aka Larkinville, we heartily concur! Voices from the Rust Belt features a collection of essays edited by Anne Trubek previously published in Belt City anthologies including writers from Pittsburgh, Cleveland, Detroit, Flint, Youngstown, Akron and Buffalo. The essays in the book “address segregated schools, rural childhoods, suburban ennui, lead poisoning, opiate addiction, and job loss. They reflect upon happy childhoods, successful community ventures, warm refuges for outsiders, and hidden oases of natural beauty. But mainly they are stories drawn from uniquely personal experiences: A girl has her bike stolen. A journalist from Buffalo (Margaret Sullivan) moves away, and misses home. A father gives his daughter a bath in the lead-contaminated water of Flint, Michigan” (from the introduction). Books will be available for purchase at the event through Talking Leaves. A signing will follow the talks. Beer, wine and other refreshments along with snacks will be available for purchase from the Filling Station. The event is free and open to the public thanks to the support of presenting sponsor KeyBank and sponsor Independent Health. Talking Leaves is the co-sponsor of the Larkin Square Author Series. 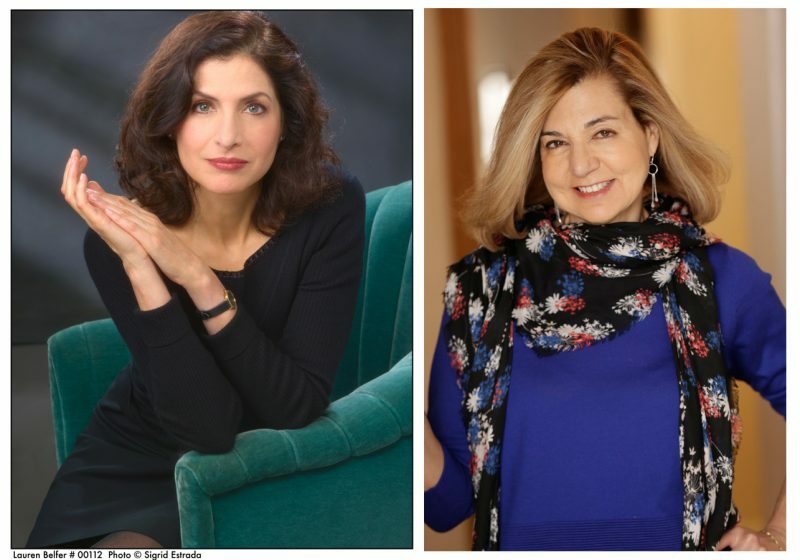 The Larkin Square Author Series welcomes Lauren Belfer and Margaret Sullivan on Monday, June 25th at 5:30 pm to Larkin Square. The two nationally acclaimed writers and expat Buffalonians will interview each other on stage and then open up the event to questions from the audience. Lauren Belfer is the best selling author of City of Light, And After the Fire and more. Margaret Sullivan is the former managing editor of the Buffalo News, former Public Editor of the New York Times and currently the Media Columnist for the Washington Post. Books will be available for purchase at the event through Talking Leaves. 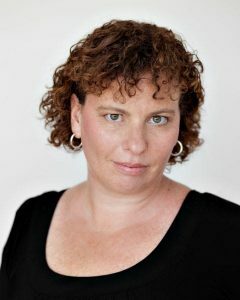 Included books are a selection of novels by Lauren Belfer and Voices from the Rust Belt which includes an essay written by Margaret Sullivan. Beer, wine and other refreshments along with snacks available for purchase at the event. Book signing to follow the talk. 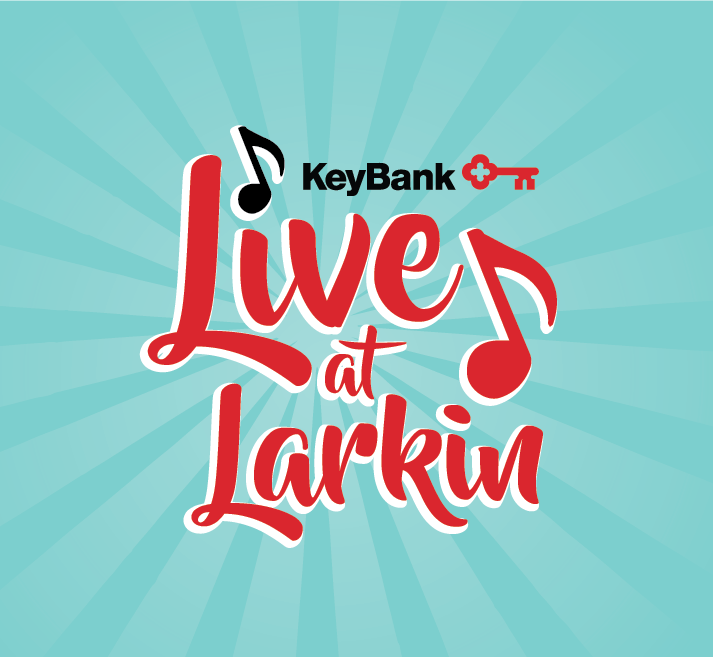 KeyBank Live at Larkin Returns June 6! 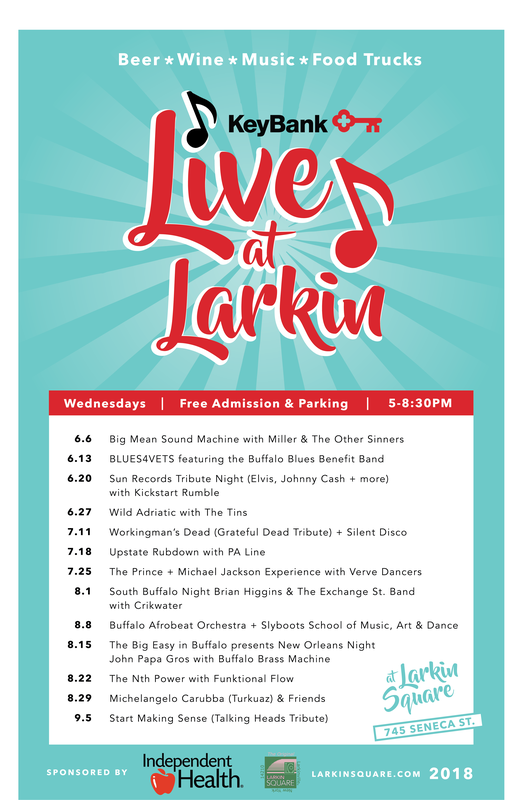 Larkin Square’s signature music series is back! KeyBank Live at Larkin will be 13 weeks of rocking live music beginning June 6. 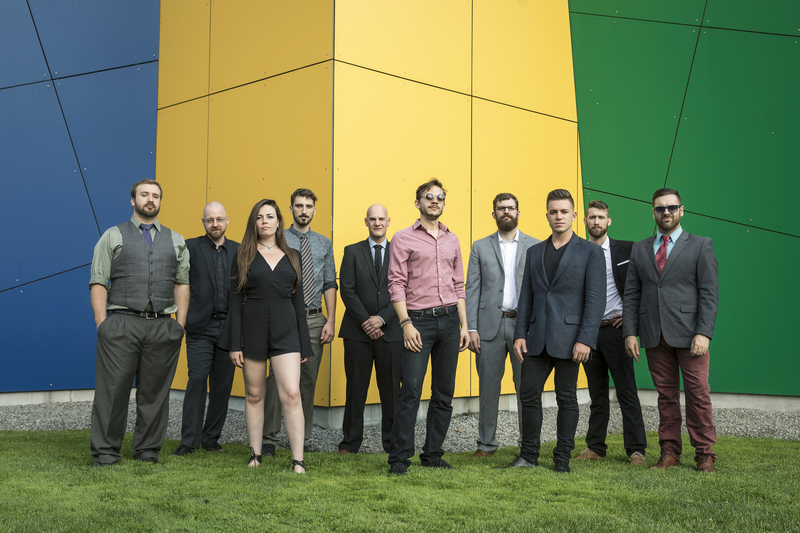 This season is an exciting mix of local talent plus nationally touring bands making their debut at Larkin Square. There is an abundance of free parking during KeyBank Live at Larkin. Lots located on Exchange and Seneca Streets are free to park in, including the gravel event lot located at 111 Hydraulic Street. Ride sharing to and from Larkinville is also encouraged! KeyBank Live at Larkin kicks off at 5:00pm every Wednesday (no concert on july 4), and features a range of different food trucks each week, specialty beverages, entertainment and law games. Enjoy the outdoors this summer and get to the best happy hour in town! Check out the full lineup below.